The Botanical Gardens in Copenhagen are a great attraction to visit if you have a couple of hours and want to do something relaxing. They really are beautiful and even if you have only a passing interest in gardens, you’re sure to get something out of your time here. There are lots of outdoor garden areas to walk around and most are landscaped to represent different kinds of growing locations. There’s a lake, impressive rock gardens, and more formal areas too. The gardens saw a huge restoration scheme in 2012 and you can see the effect it’s had. For us though, the highlight of our visit was the massive greenhouses which act as a centre piece for the gardens. Inside, there are exotic plants, tropical plants, trees and even a butterfly house. You feel like you’re in the sweltering heat of some kind of jungle when you’re inside and the largest section even has spiral staircases to climb so you can look down on the greenery. From up here, you get a totally different view of the larger plants that are happily growing there. Take care though, as some of the leaves cover parts of the walkway and you have to duck to get underneath. Also, the steps do get slippery as the warm air condenses on them. The Botanical gardens, (Botanisk Have in Danish) are open every day at 8.30am and close at 6pm in the summer and 4pm in the winter. Admission is free. There is a shop selling plants and a pleasant café on site too. 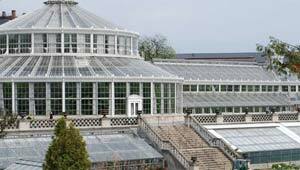 The Botanical Gardens are in Copenhagen city centre, across the road from Rosenborg Castle. The Hop-on, Hop-off Bus Tour has a stop to allow you to visit both.